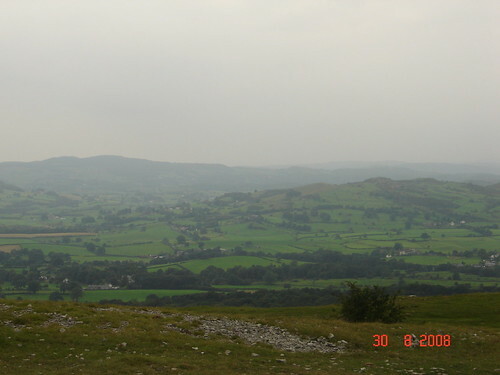 Yesterday afternoon, I took the sprogs for a stroll on Scout Scar. 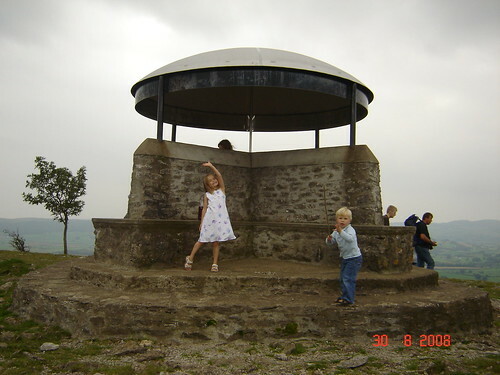 It’s a small hill near Kendal (235m). And what’s more you can park virtually on the top. 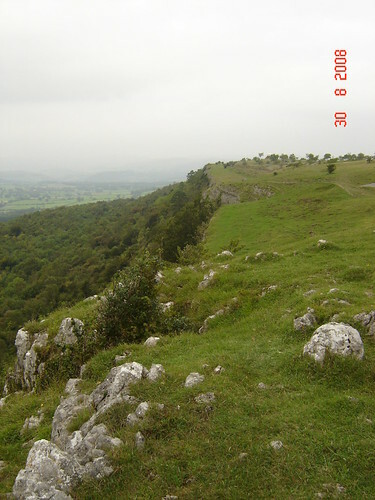 The limestone strata here are tilted so that on the East side the land slopes gently down to Kendal, but on the West it falls away dramatically in limestone cliffs. The views can be excellent, but the sky was once again the same flat monotone grey that we’ve been stuck with for days and the higher and more distant hills of the Lakes were hidden in the haze. The shelter is known as the ‘Mushroom’. 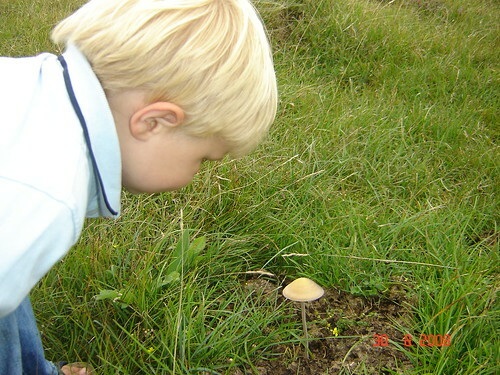 We were to find many more mushrooms on our walk. B was particularly titillated by the fact that, for the most part, they were growing in the centre of cowpats. We’re rounding off the holiday period with a flourish. Well – day trips. Yesterday we went up to Windermere with the Outlaws and some Aussie Relies. 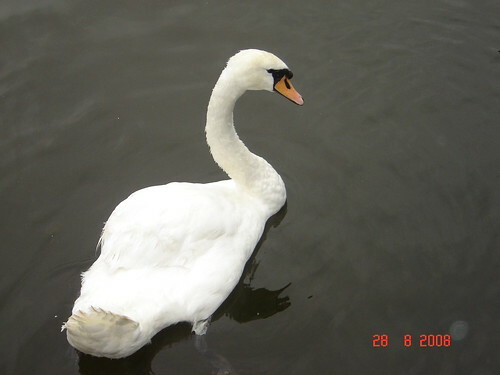 We took a cruise on the Lake (hence the Swan), to Waterhead and walked into Ambleside. Today we went to Skipton, despite Northern Rail’s best efforts to prevent us. The train was so full that they wouldn’t let us on. Fortunately our connection was only a few miles away in Carnforth so we managed to drive there and catch it. Just. 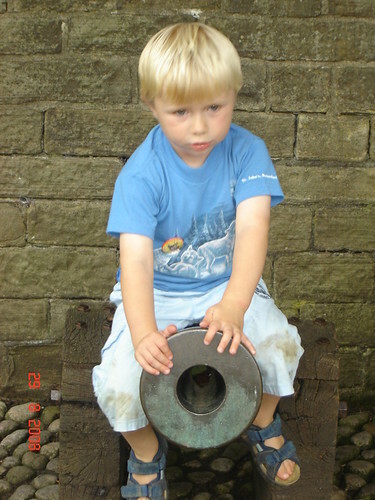 We looked around Skipton Castle which is well worth a visit. After last week’s clambering on The Singing Ringing Tree and falling off an Andy Goldsworthy sheep pen ‘sculpture’, this week B ‘are been mostly’ climbing on ancient monuments. And I don’t mean his Granddad. In the evenings too I’ve been busy. Four consecutive nights of short brisk walks in the last of the light (or after). Dog walks without the dog. Two circuits via the Cove and the Lots. One trip through Eaves Wood to the Pepper Pot. And tonight an out and back across the field to Silverdale Green to do a loop around Clark’s Lot. There hasn’t always been a lot to see. Usually because it has been dark. Often I found myself thinking back to walks earlier in the year and things that I noticed then and posted about. 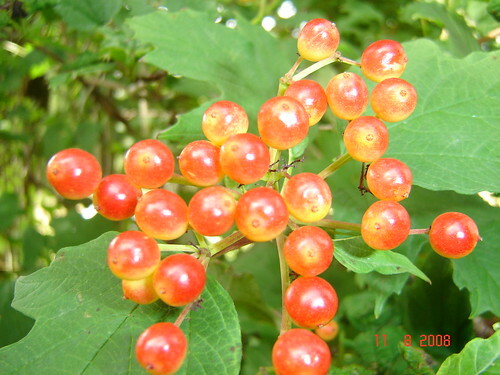 In Eaves Wood I saw black berries where there were yellow flowers on the Tutsan. 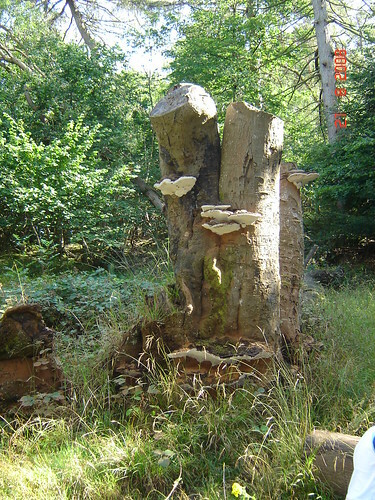 The huge ants’ nest near the ruined cottage in Eaves Wood has gained several inches in height and three large stones that somebody placed on top have almost disappeared. In Pointer Wood I remembered the raucous morning Rooks that I met there several times in the spring. I’ve been reading Wildlife In A Southern County by Richard Jefferies which I bought earlier this year in a second-hand bookshop in Bishop Auckland. It’s a really enjoyable read and details both the flora and fauna and the human inhabitants in Jefferies home patch at the end of the nineteenth Century. The book clearly draws on an intimate knowledge of one small area based on many years of patient observation. A more modern book of this type would almost certainly tell us something about the author too, but I think that his pleasure and enjoyment shines through from his descriptions. Well we’ve had a couple of more pleasant days. Today in particular was good. Not especially warm, but dry and occasionally sunny. As a result we’ve spent much of the day outdoors in the garden and at the children’s playground. Tonight I even dragged myself out for a walk – some actual ‘beating the bounds’. It wasn’t a long walk. Just a brief stroll through the village and across the Lots to the Cove. Lately, I haven’t done half enough of this ‘walking and gawking’ (as Ron at Walking Fort Bragg calls it). It doesn’t really need to be a long walk. Just to be outside is therapeutic. The song of the wind in the trees. The smell of the sea. The texture of the mud and water in the Bay – enhanced somehow by the low, post-sunset light. I’m drawn to the cove at this time of day, as the light drains from the sky. 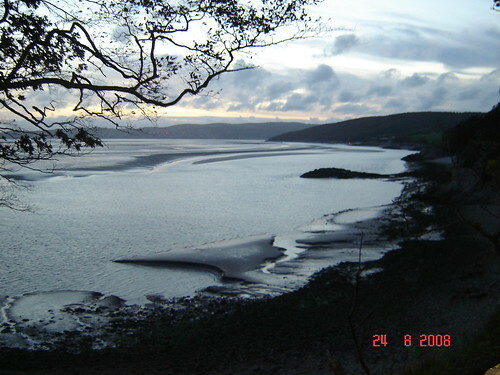 To the South the coast is dotted with the lights of Morecambe and Heysham and in the North, Grange and Kents Bank. But looking West toward the dark hump of Humphrey Head and the long horizon of the Bay it is easy to imagine that nothing much has changed here for a very long time (although you have to ignore the occasional winking light, presumably from a gas platform or wind turbine.) There is something raw and elemental about the Bay in these conditions. It’s a while since I’ve been here, and the shape of the channels near to the shore has changed. Almost inevitably, the dark outlines of two herons are poised on the far side of the channel, fishing in their usual patient way. UPDATE: for those arriving from a search engine looking for Andy Goldsworthy sculptures – this sculpture is not by Andy Goldsworthy, but was designed by award-winning architects Tonkin-Liu. 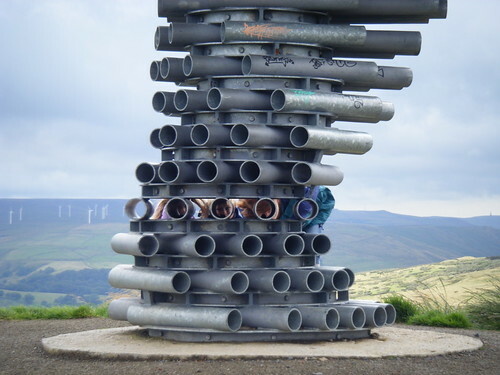 Last week we happened to be passing by Burnley and I bullied the rest of the family into making a diversion to Crown Point above the town to see (and hear) the Singing Ringing Tree. I don’t think that they minded in the end. Despite protesting at the cold and the wind when we stepped out of the car. We didn’t add to the graffiti, but we did have a bit of a clamber. Does that make us philistines? 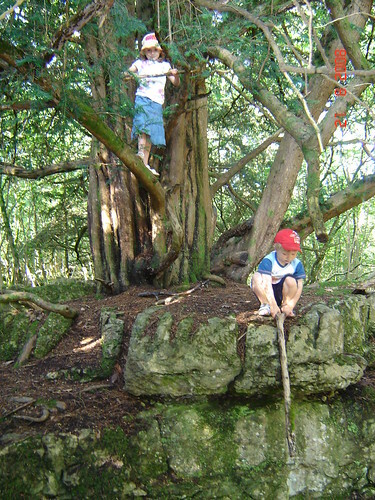 Later in the week B would hurt himself falling off an Andy Goldsworthy sculpture at the Yorkshire Sculpture Park – but that’s another story. 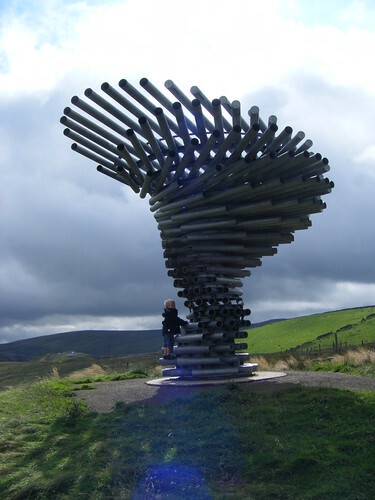 The Singing Ringing Tree is one of several panopticons sited in the Pennines intended to entice people into the outdoors. 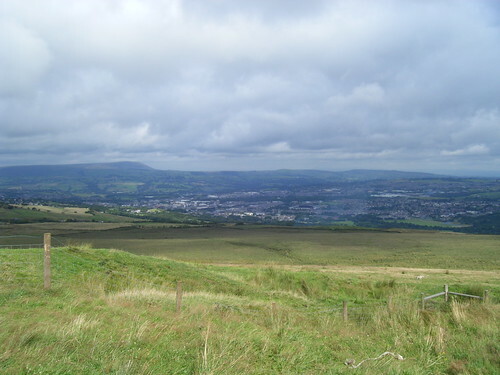 Crown Point is a bleak spot on the edge of the Moors, although there is a panoramic view of Burnley and its environs. I imagine that it is nearly always very windy there which gives the Singing Ringing Tree its special quality. The sounds it makes are eery and rather plaintive. Like a choir of lost souls stuck up on the moors wailing. This is not my film. You can find the original here. I’m never sure about the netiquette of posting other peoples stuff. 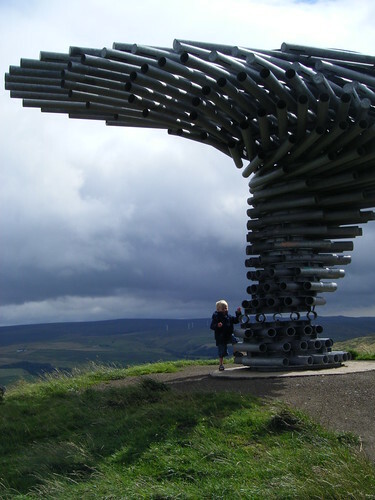 Although the Singing Ringing Tree is about an hours drive from our home, I might never have known about it if I hadn’t read about it in Words From The Northwest Woods which, ironically, was written by Cynthia who lives in the Pacific Northwest – a long way from Burnley and the West Pennine Moors. Strange how these things work. With cloudy but dry weather yesterday, and even some sunny spells, we made it into Eaves Wood for a stroll. One effect of this wet summer seems to be an abundance of fungi in the woods. These brackets on an old beech stump are always there, but yesterday they were gently smoldering like briquettes on a barbecue. Sadly the photo doesn’t capture it, but you can just about pick out the coating of brown spores on the bark and on bramble leaves at the base of the trunk. A part of the tree trunk lies next to the stump and was also liberally covered. It will be interesting to see whether brackets develop on there too. I’ve been disappointed and alarmed by how few butterflies I’ve seen this summer. 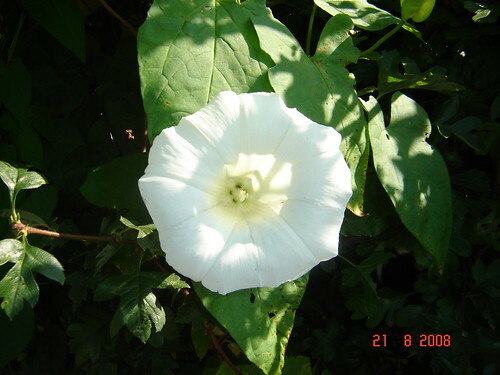 I hope that populations have not been adversely affected by the rotten weather. 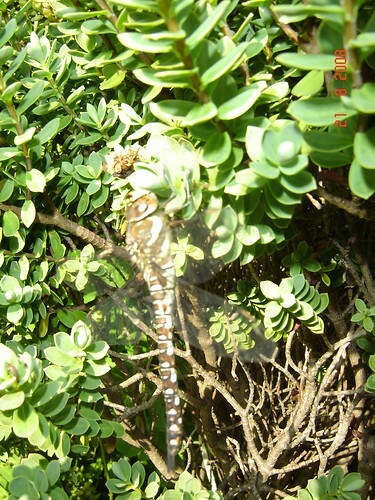 The dragonflies don’t seem to mind. The field we crossed approaching the woods yesterday was busy with them. No opportunity to photograph them presented itself until we were back at home playing in the garden. There were several dragonflies about, but this one was sunning itself on a Hebe and seemed quite happy to be photographed. Unfortunately, I’ve had to send my new camera to Olympus to be repaired – there is something wrong with the zoom function. I’ve reverted to using the Sony which doesn’t have much of a zoom so I was holding the camera quite close to the fly. I can’t work out how to turn of the flash and it seems to have rather washed out the colours. 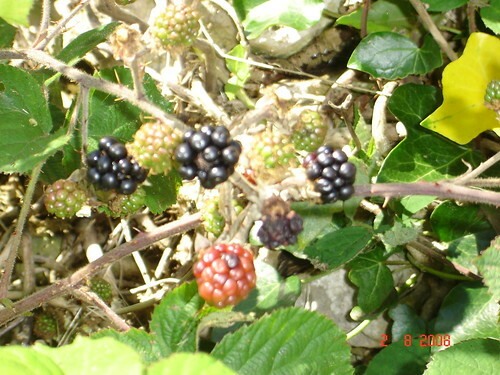 Once again we managed to get out between showers and spent some time on Moss Lane collecting blackberries for some Apple and Blackberry jam. 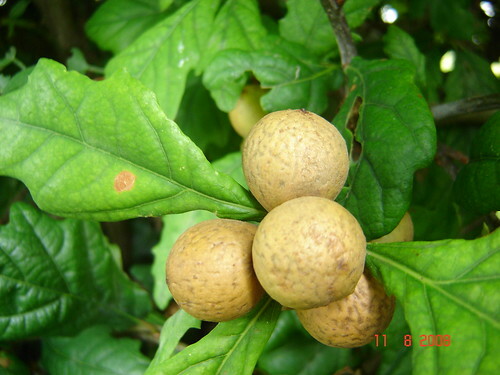 Most surprising to me was an oak absolutely festooned with oak apples. I’ve never seen so many on one tree. None of this has anything to do with the instrumental that closes Tom Waits’ magnificent album ‘Swordfishtrombone’, but I was listening to it earlier today and the title, and the melancholy nature of the tune, seemed appropriate for the weather we’ve experienced this summer. 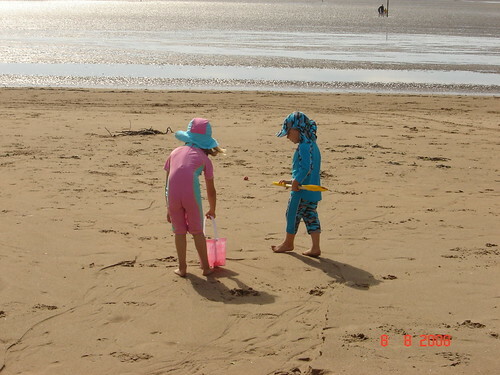 Last week the sun poked it’s head from behind a cloud briefly and after a rush of blood to the head I packed our two oldest kids into the car and took them away for a few more days by the sea. 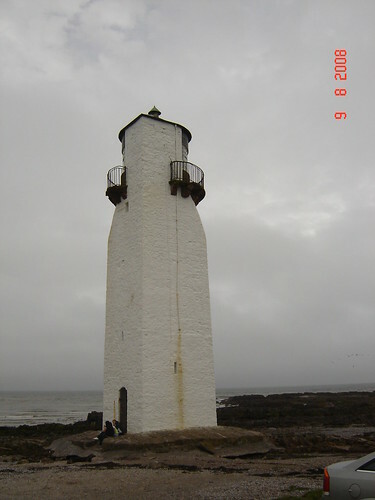 This time we went to the Solway coast in South West Scotland – a lot closer than North Wales. 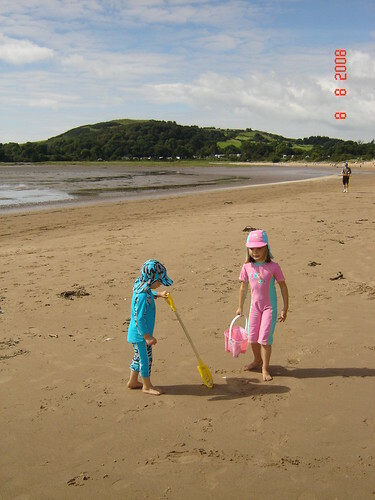 I chose the site based on online reviews which said that it was quiet, family friendly and right by the beach – all of which turned out to be spot on. Only a small line of dunes separated our pitch from the beach. 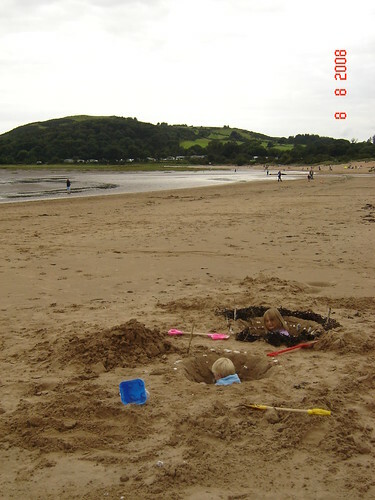 It was a nice beach – backed by dunes but with cliffs on either side. 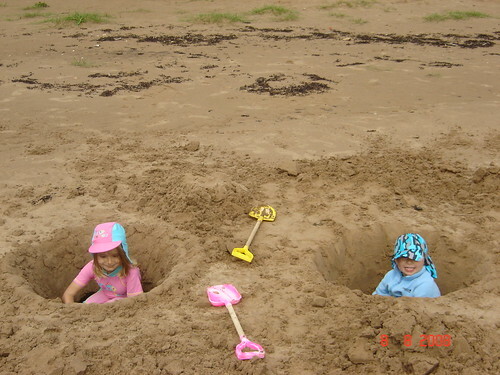 It was slightly odd in as much as although it was sandy, further down it became soft squishy mud. The tide when it was out was a very long way away. When it came in, it came in fast, but was only a couple of inches deep. The weather wasn’t always ideal, but we did manage a day and a half on the beach. 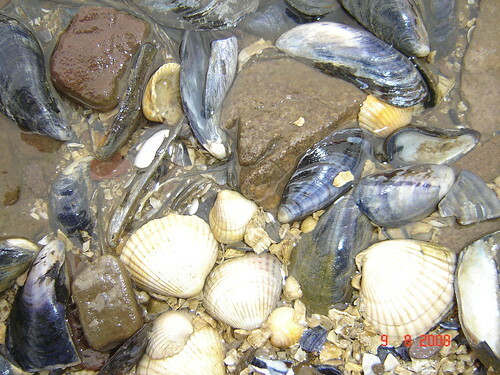 You can see here the transition from sand to mud – where the texture and the angle changes and the beach clearly becomes wetter. We even had some blue sky – for a while. On Saturday the weather was not fit for the beach. 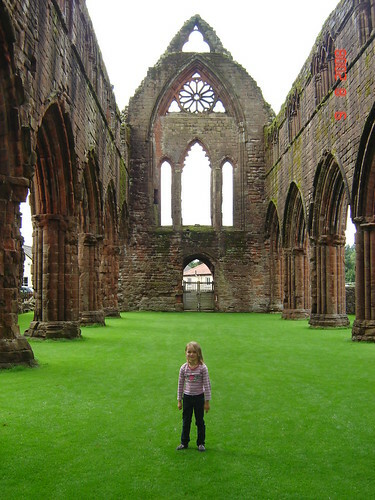 We checked out the charms of nearby Dumfries. 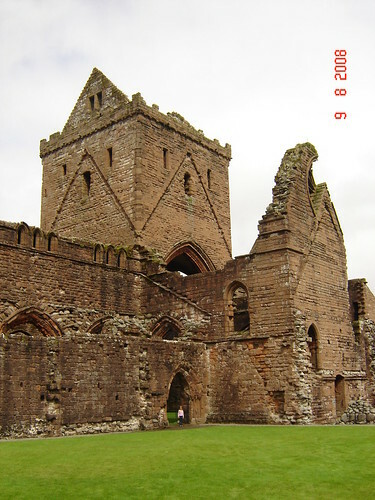 On the way back to Sandyhills, with the weather improving, we stopped at New Abbey and visited the Sweetheart Abbey and the water powered Corn Mill. The corn mill is still in full working order and was operating when we visited. It was fascinating. At the mill pond the miller introduced us to a brood of 5 day old Mallard chicks. Our final day was showery. The showers decreased in frequency and ferocity as the day progressed. 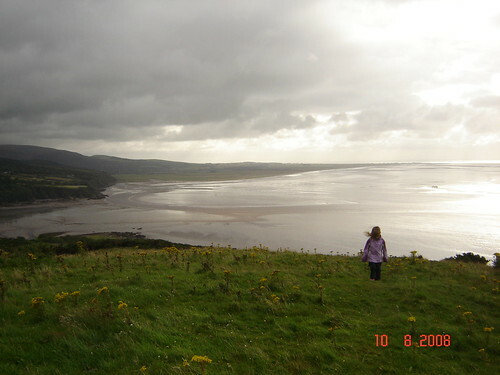 In the morning, when the showers were still heavy and regular, we climbed along the coast path to the hill west of the bay, Torrs Hill. 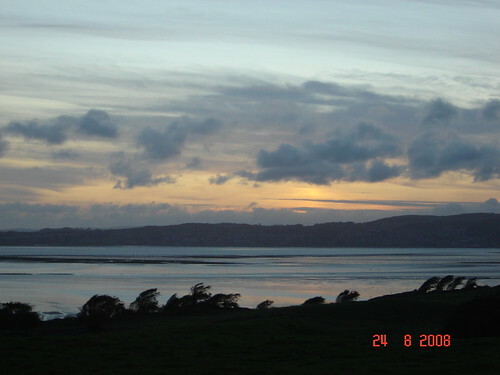 The Lakeland Fells, across the Firth, had reappeared after the clag of the day before. Through gaps in the cloud the sun was lighting the Firth in silver and gold. The views were stunning. Sadly my camera was playing up and I have no photo of the Needles Eye – an impressive natural arch by the cliffs. B revelled in the inclement weather and the steep and muddy path, but poor A found the whole experience a bit much. 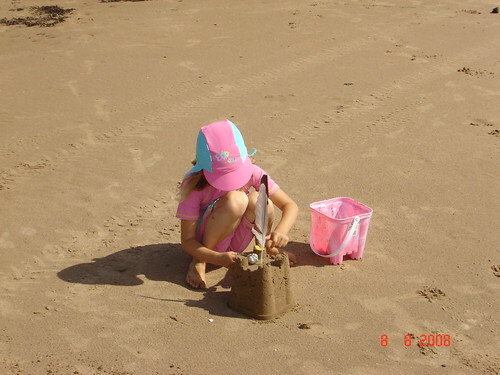 Fortunately, as the weather improved she really enjoyed the playground on the campsite and another trip to the beach.